A map is better than a table: When is it best to buy gas in the USA? If you want to find the cheapest gas in your area, you should check out GasBuddy. A couple of days ago on their blog they published a simple study they did that includes a table for the best times to buy gas by state. This table is great for looking up your individual state, but it’s impossible to see any patterns in the data. I recreated the data in Excel and opened it up in Tableau. The first thing I noticed is that the data seemed too sporadic for me, so I took the liberty of grouping the data into four buckets: Early week, mid-week, late-week and the weekend. In less than 5 minutes, I had this map. 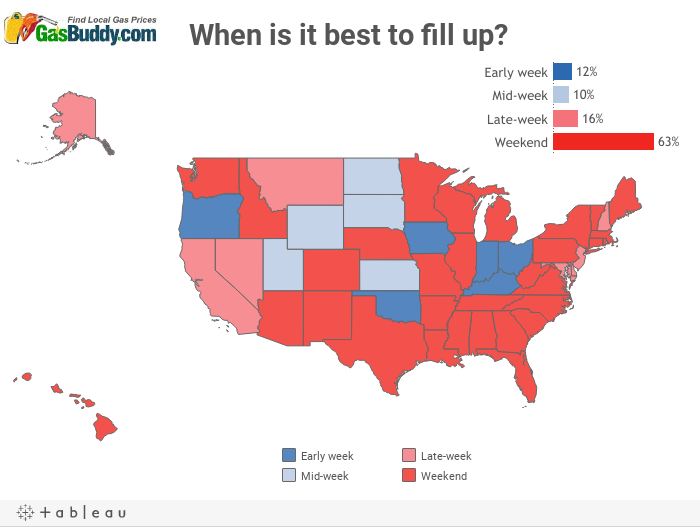 Now it’s much easier to see that in the majority of the US, you’re going to find the cheapest gas on the weekend. It’s much tougher to discern that from their table. Click on the color legend or the table to highlight. Andy, very cool but I would not have used red and blue as we have come so accustomed to red meaning Republican and blue meaning Democrat. Good point. Emily and I were having a discussion about the color choices too. What would you have used? Steve, here's Emily's makeover. I like her color choices much better. Nice view Andy. Regarding colours, I try and stay away from red, amber or green unless I'm trying to show something good/ok/bad such as a RAG status of some IT metric. My default response to seeing red is that something is bad, or needs attention. OK and OH both have Early Week, Mon/Sat as the result. I am not sure what Mon/Sat is in terms of describing a range of days.